This digital EP came out over the summer, but I didn’t discover it until Aesthetic Audio published a Miles Sagnia 12-inch last month. It’s been a while since a new release has gotten me this excited. The tracks cross genres, ranging from deep house to ambient. “Perseverence” [sic] falls squarely in the former category, with a solid beat and soulful singing. Chords decay and electronics burble over a spacious ten minutes. “Karmic Tendencies” is a bit dubbier, with a thick bouncy bassline. Once again sparse vocals stay back in the mix. The final track, “Follow the Light” is a pleasant surprise. Call it IDM or ambient, it is a superb meditation on background voices. Chords slowly change as bleeps and static coax out a rhythm. 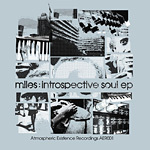 Miles has been a London DJ for years, but he only started producing his own music recently. If his first two solo efforts are any indication, he has a bright future ahead.